(March 5, 2018) The countdown to Better Naito 2018 began today with the announcement by the Portland Bureau of Transportation that the project would return for a second full season beginning on May 1 and ending on September 30. The bureau also released its 2017 Better Naito Report, which documents the first iteration of the project by the city, offering in-depth data analyses of travel times, traffic volumes, mode-splits and more. The project was incredibly popular with people walking and biking. In just one day, over 12,000 people walking used Better Naito to access the Waterfront Blues Fest. What's more, a total of 393,173 one-way trips were taken by people on bikes on Better Naito over the five-month project period. 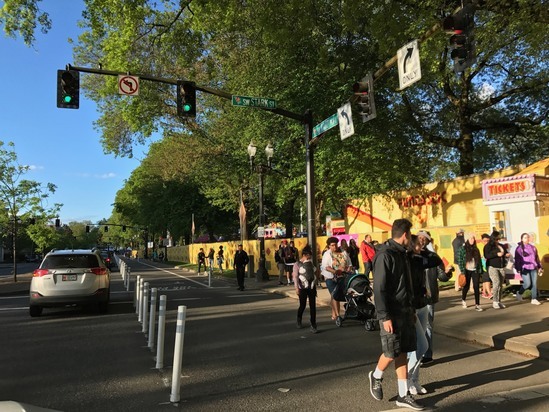 Better Naito, which reconfigures Naito Parkway from the Hawthorne Bridge to the Steel Bridge for five months, provides a protected space for people to get to and around Governor Tom McCall Waterfront Park during Portland’s busy and popular festival season. Consistent with the data collected during Better Naito’s two pilot seasons in 2015 and 2016, the 2017 season had minimal impact on motor vehicle travel times in the corridor. Current observations and analysis found that during peak morning commute hours (7:00-8:00 a.m.), driving times for northbound traffic from SW Clay St to SW Stark St increased by 1 minute 28 seconds. Similarly, the traffic impact for afternoon peak commuters (4:00-5:00 p.m.) was an additional 1 minute and 33 seconds. The locally-developed smartphone ride tracking app Ride Report confirms the popularity of Better Naito, showing that people bicycling were twice as likely to ride Better Naito than the Waterfront Trail. Likewise people biking were 3.5 times as likely to ride on Naito Parkway during the Better Naito season than during the off-season. For additional information about Better Naito, please visit the project website: www.BetterNaito.com. Questions, feedback, or concerns? Please email naitoparkway@portlandoregon.gov or call (503) 823-4321. Families walk in Better Naito outside the entrance to the Portland Cinco de Mayo Fiesta in May 2017. Photo by Portland Bureau of Transportation.